Mixing and matching is so much fun! Are you enjoying our BoBunny Mix and Match Week so far? Today, Keri and Romy are going to inspire you with some Off The Page projects they have created using a wonderful mix of BoBunny collections. Keri has created a gorgeous piece of wall art and Romy a beautiful gift box. I've been wanting to make some neutral decor for the music practice area in our home, so when I saw this musical-notes paper (Woodland Winter - Cozy), it was a perfect start. Mixing & matching products from different collections has always been one of my favorite ways to create, so I got right to work. I sifted through all the gorgeous products from Woodland Winter, Pincushion, and Head Over Heels, to find neutral products with a vintage vibe. Designer's Tip: When working with a monochromatic project, look for patterns in different scales & motifs to give the project contrast. I used this idea on my project by placing the larger-scale floral in between the layers of diagonal stripes & music notes. 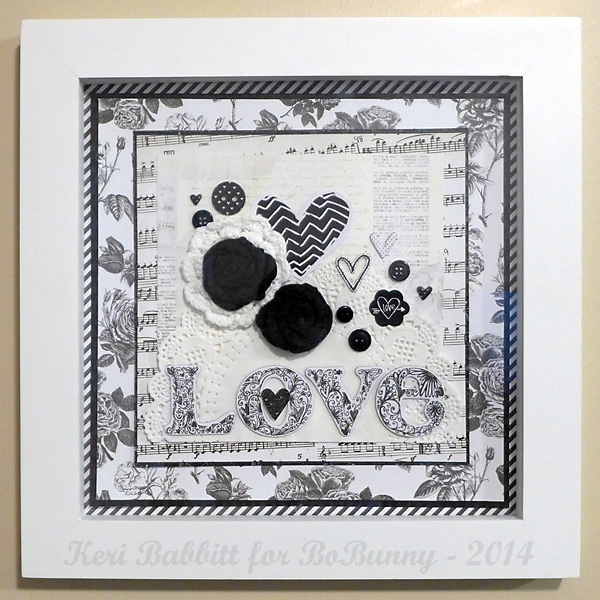 I love the beautiful variety of neutral embellishments that BoBunny offers. 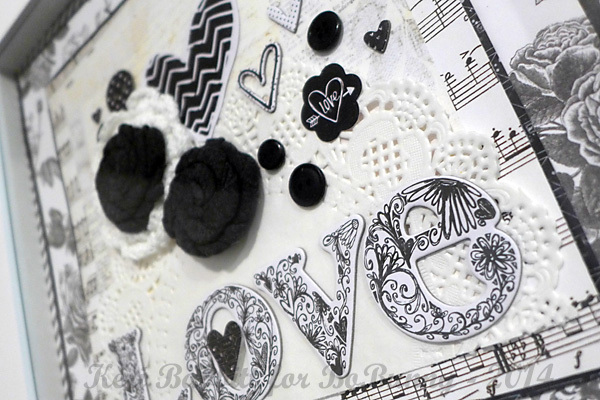 The fabric, chipboard, buttons, and doilies add so much texture and dimension to this shadowbox decor piece. It's usually the more bright papers that get my attention first, but this time around I decided to go for a less bright and happy and more masculine colour palette when making a gift box for Valentine's Day for my boyfriend. 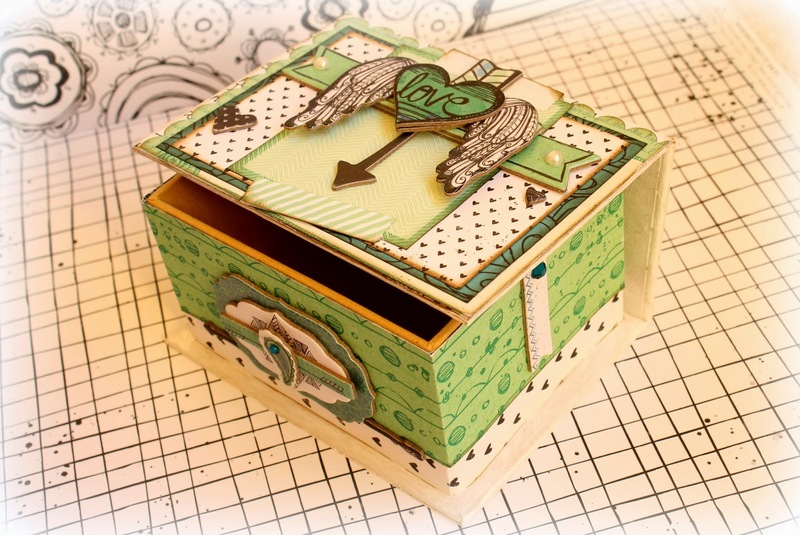 To make this gift box I combined two different collections: Zip-a-Dee-Doodle and Head Over Heels. 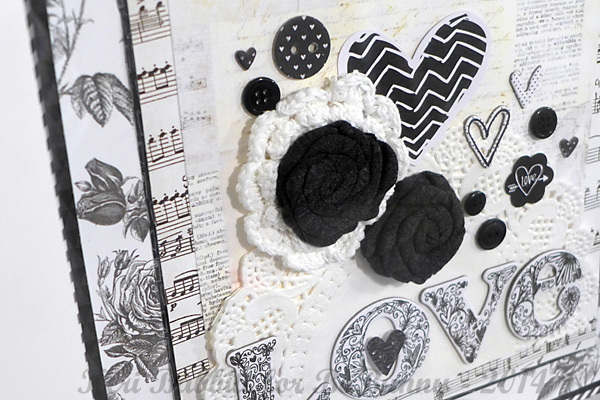 The black and white papers from the Head Over Heels collection matchthe papers from the Zip-a-Dee-Doodle collection perfectly. I found that the hint of blue in the Zip-a-Dee-Doodle papers and embellishments added just the perfect amount of colour. The layered chipboard stickers are actually my favourite embellishments from Bo Bunny. 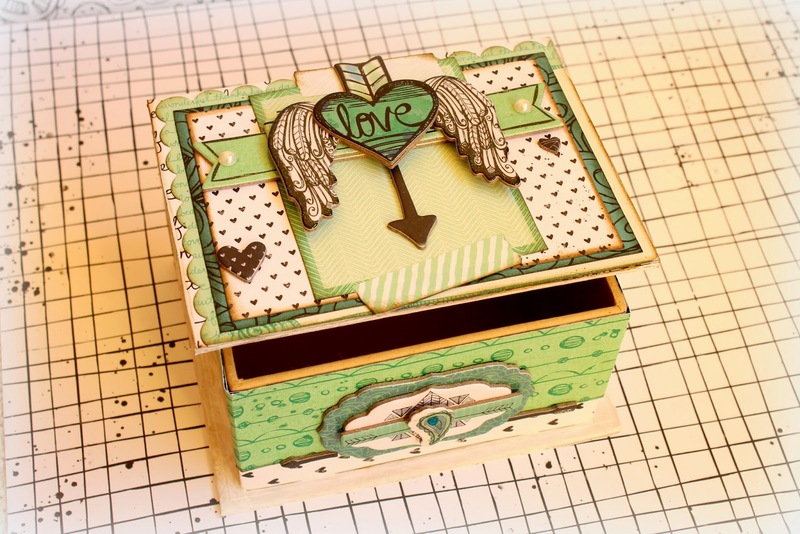 I often go for an even more layered look by stapling different stickers on top of each other, just like I did with the banner, the heart and the arrow on top of this gift box. I absolutely loved this chipboard heart sticker and have been waiting for the perfect occassion to use it. I figured that by layering it on top of other stickers I could turn it even more into a real eye-catcher on my gift box. Designer Tip: When working with different collections, it can be very helpful to first select all papers and embellishments that you want to work with and to decide which colour combination you want to use. If you already have an idea in mind, it becomes much easier to mix and match collections on an altered item. the colours are DELIGHTFUL too!!! THANK YOU for the inspiration Keri & Romy!!! 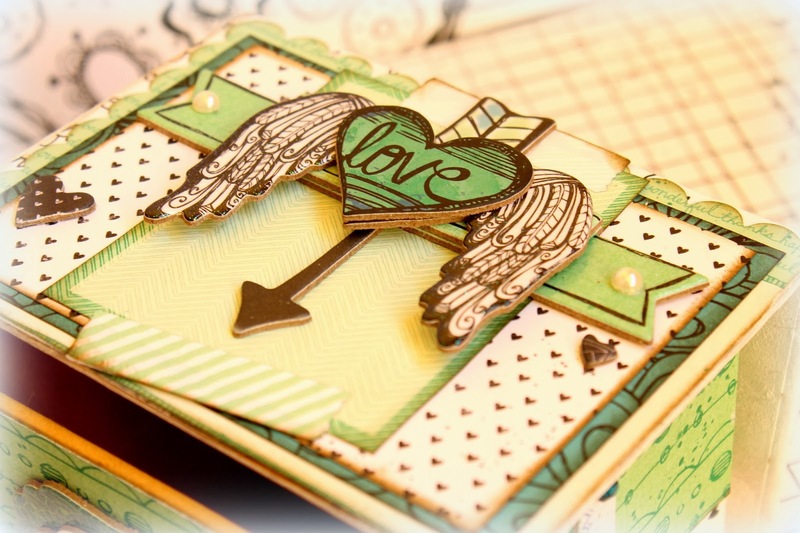 Sooooo gorgeous...love the wall art as well as the beautiful altered box! I simply adore your wall art, Keri! Wonderful work with the black and white products! Fabulous projects Romy and Keri. Loved each piece to bits! I love both of these projects! The wall art is so bold yet so calm. I love the color pattern on the box.